Thus begins a trio of coffee-related videos by a non-coffee drinker. Just to prove we can love things without drinking them, eh? This card will share some tips for newbies to coloring – especially that the Desert Storm cardstock is really forgiving for blending! And if you fussy cut out the images, you remove the need to worry about staying in the lines. It’ll help get you going on blending while taking out some of the worries! Watch the video below or click HERE to see it in HD on YouTube. 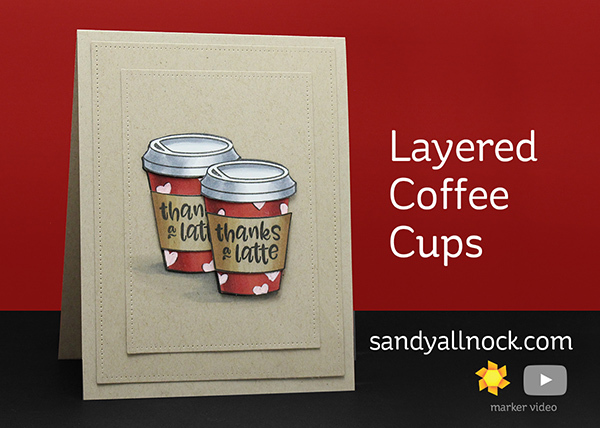 Thanks for sharing this card and video, Sandy. I’m enjoying this series of videos on “coffee”. I’m a daily drinker when it comes to coffee! I dinero k coffee either but I know plenty of people who do. Sandy….I LOVE watching your videos. You are such an inspiration. Thank you so much for showing us Neenah desert storm. I have tried my Spectrum noir markers on Kraft cardstock and found the alcohol ink to bleed a lot, as well as not blend too easily. I thought it was just me as I am new to alcohol marker coloring. Thank you for showing that not all Kraft cardstock is equal. I am excited to purchase the Neenah desert storm, as I am loving coloring on the Neenah classic crest solar white. Live and Learn. Thank you for imparting your talent and knowledge! These are adorable!!! Sooo cute with the red and white heart print! Great video and I really love your card. I think I might be able to color like that 🙂 Thank you for sharing. Oh, I love this card! Thanks a latte for all the tips and tricks. Fun card—I’ve never used Desert Storm but will try it on some kraft in my stash. Clean, simple and Gorgeous! Thanks Sandy for the tip about the lid. AWESOME coloring, thanks for the video! I am always amazed at the dimension you achieve just with colouring. You certainly have an eye for detail. An amazing job as always. What a nice, low-stress way to start the week. 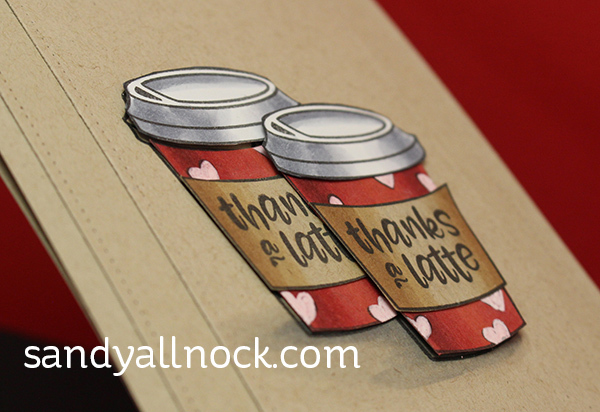 Love the soft colors, the tips on blending with the Desert Storm cardstock – and of course anything with a coffee theme. For a non coffee-drinker, you really get this!! !